We were lucky enough to go on a family skiing holiday this January…. sunlight, snow, fresh air, exercise, skiing and just an all round great experience. I have asked my three children the best things about the holiday and here are their responses…. So a mixed bag of responses there but with the one common denominator… THE SNOW!!!! And who could blame them, I loved it too! Especially on our last day, the weather got colder and we had a wonderful day of snow. At lunch time our entire group (15 of us in total) took the cable cars to the top of the mountain for lunch. The snow up there was thick and deep and as it fell on us we all remarked on the beautiful snow flakes… each one a perfect crystal, large enough to see the tiny branches coming off each arm of the structure. So the inevitable question came from the children…. 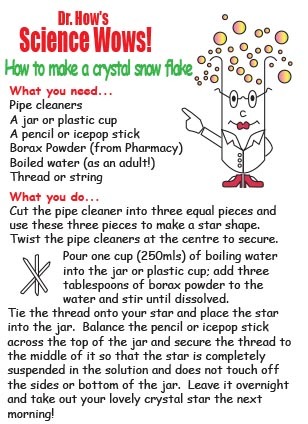 A snow crystal is a single crystal of ice that can come in many different shapes. A snow flake is the term we are more familiar with – it can refer to one snow crystal or a group of snow crystals all grouped together. 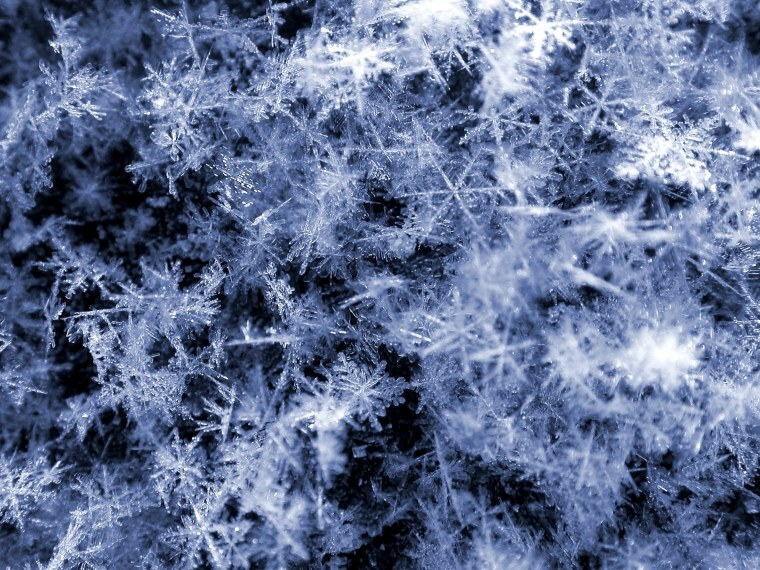 Some snow flakes can contain a clump of hundreds of tiny snow crystals. So what factors influence the distinctive shape of each snow crystal? Well for starters there is the temperature at which they form – snow crystals start to form when the cloud temperature reaches or drops below freezing (zero degrees Centigrade (C)); the amount of dust or dirt particles available also effects snow formation. Then there is the location of the clouds in which the snow crystals form… in general snow flakes are larger when formed in high clouds compared to snowflakes from lower clouds. This factor links with the length of time the snow flake takes to fall to the ground along with the air temperature as it falls and with how many collisions the snow flakes might encounter. Snowflakes will often heat and cool as they drop due to differences in air temperature, this often leads to large snowflakes as they become more “sticky” when they melt at the edges, allowing them to clump together as they collide and refreeze. 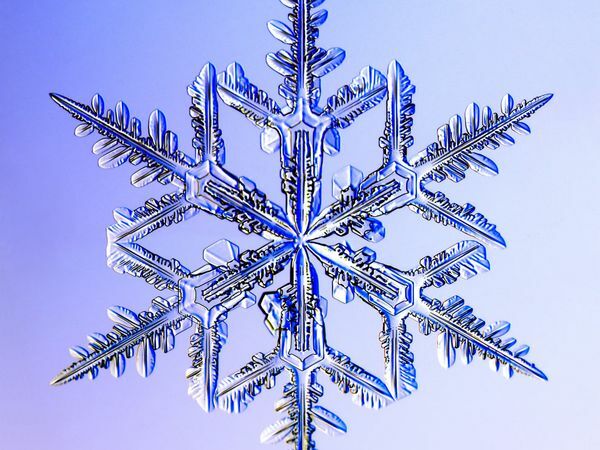 Other weather factors such as humidity (how much water vapour is in the air) and the wind speed all contribute to the final size and shape of the snowflake formed. So this is today’s snow in the west of Ireland! As I write this I am looking out on a typical “Irish” snow scene… the ground is covered in patchy white snow that is made up of small ball shapes of snow flakes that are a bit wet and sticky. On the plus side these make great snow balls… I can vouch for this one myself as my back is still wet from the pelting I got from my husband as he left for work today (the biggest child in the house)!! So this snow was probably made at lower temperatures in high clouds and melted and froze as it fell to the earth through moist air; this would result in large snow flakes (like small snow balls) made up of a number of small snow crystals joined together. This snow does not tend to last too long, beginning to melt as it hits the ground, making for that wet sticky snow! The simple answer to this is YES and NO! 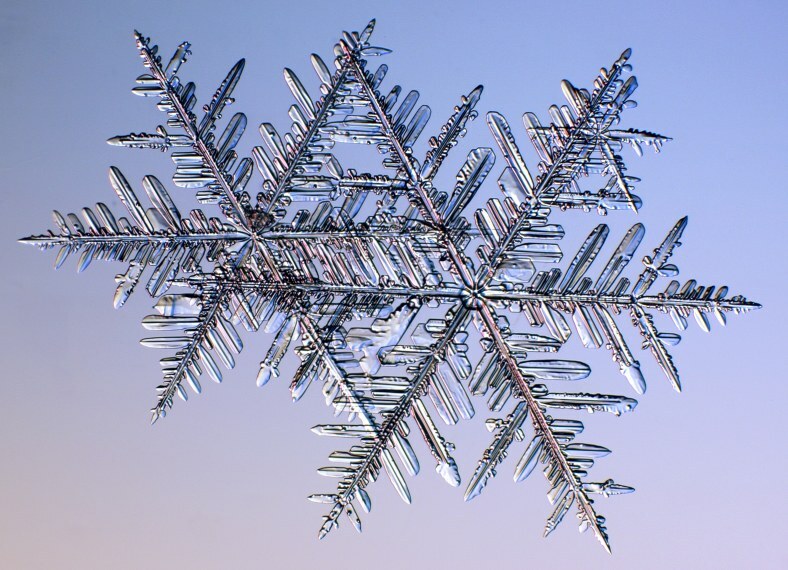 Although we cannot vouch for every single snowflake that ever existed, science does suggest that the exact shape and structure of each natural snow crystal is unique – so that means YES – no two snow flakes are identical. Especially if you consider the different factors that are involved in creating each snowflake! HOWEVER, for more simple snow crystal structures it can at times be hard to tell the difference between two under a microscope! When we observe the colour of an object we are actually seeing the colour of light that the object REFLECTS (bounces back)- so green grass, for example, is ABSORBING (taking in) all light expect green light, which it is reflecting. When an object appears white that means it is actually absorbing very little light and reflecting most or all of the light falling on it. This is the case with snow, it’s crystalline structure creates many reflective surfaces making the light that falls on it “bounce back” or be reflected. You can read more about this here.